Neerav Kumar has been a passionate clarinet player for the past 10 years. He studies music at the Julliard School, pre-college division, under Mr. Larry Guy with clarinet as a major, and under Dr. Andrew Thomas with composition as a minor. 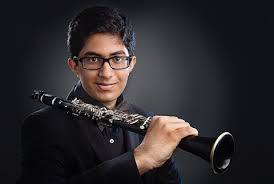 At the Julliard School, Neerav plays clarinet in the pre-college orchestra under conductor Maestro Adam Glaser and in a wind quintet under the instruction of Ms. Barli Nugent. Previously, Neerav was a student at the Manhattan School of Music, pre-college division, and the San Francisco Conservatory of Music, preparatory division, and played both clarinet and piano. Neerav was the principal clarinetist in the NYSSMA All-State Conference Orchestra for 2016-2017. Previously, Neerav was selected as the principal clarinetist and concertmaster in the Intermediate Wind Symphony and as the principal clarinetist in the Intermediate Symphony Orchestra at the Interlochen Arts Academy Music Camp for two consecutive years. Neerav played first clarinetist in the NYSSMA Area All State Orchestra in 2015 and principal clarinetist in the Intermediate Westchester All Country Orchestra in 2014. Neerav was accepted in 2011-2012 to play clarinet in the Westchester All County Elementary Band. Neerav attends high school at the Rye Country Day School, Rye, NY and has been the first chair clarinetist for the high school band. In addition, Neerav is a member of the school honors choir and a Capella group and had toured Cuba in 2016 with the school choir group.